Water is unique! Unlike other natural substances all three states can co-exist. Liquid water has a higher surface tension than other natural liquids and expands when it freezes. It is the ultimate heat bank - it can both store and transfer heat. In addition, it can dissolve and transport many substances, and even purify itself by constant cycling and recycling through the atmosphere. Water is essential to life. It is a key reactant in many biochemical reactions. These include the breakdown of starch and protein molecules in the digestive systems of animals, and the production of glucose during photosynthesis in plants. It plays a key role in controlling the temperature of body cells so that these vital processes can occur. Water also carries nutrients to our cells, enables substances within cells to collide so they can react and carries away the waste products of these cell reactions. 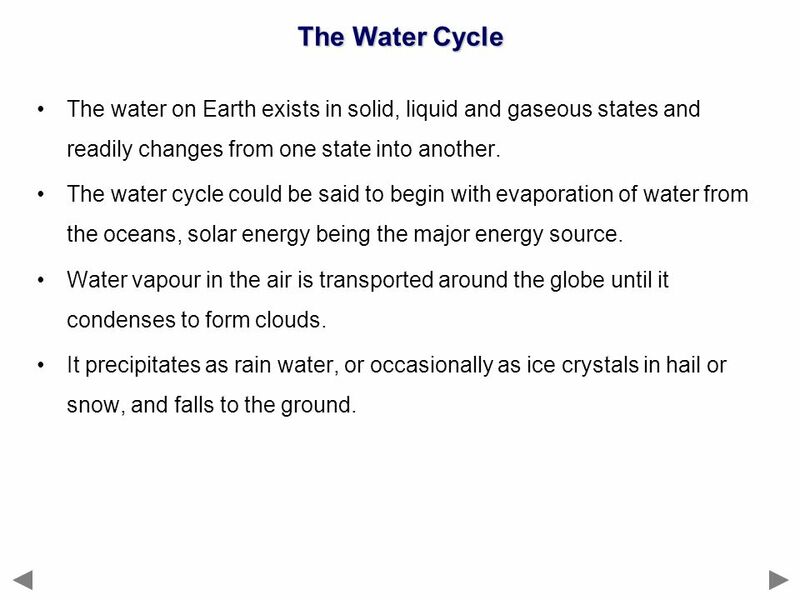 5 The Water Cycle The water on Earth exists in solid, liquid and gaseous states and readily changes from one state into another. 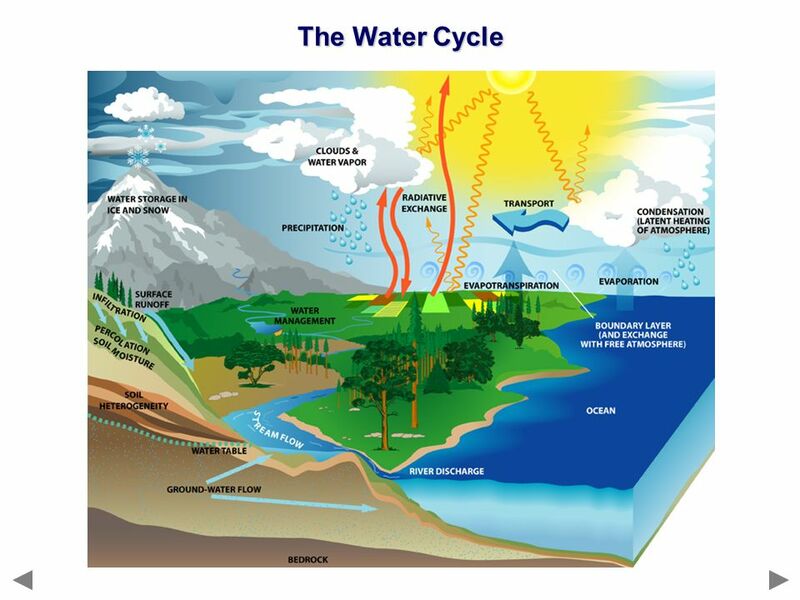 The water cycle could be said to begin with evaporation of water from the oceans, solar energy being the major energy source. Water vapour in the air is transported around the globe until it condenses to form clouds. It precipitates as rain water, or occasionally as ice crystals in hail or snow, and falls to the ground. 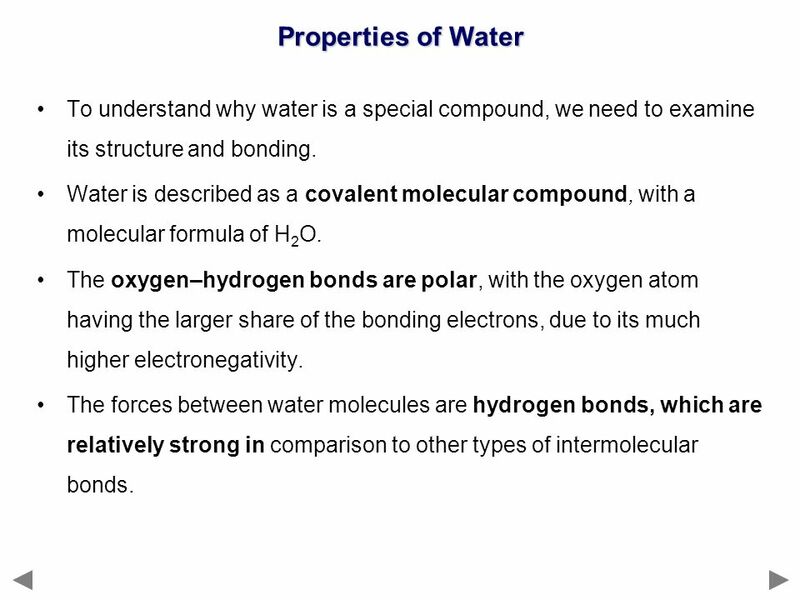 6 Properties of Water To understand why water is a special compound, we need to examine its structure and bonding. Water is described as a covalent molecular compound, with a molecular formula of H2O. The oxygen–hydrogen bonds are polar, with the oxygen atom having the larger share of the bonding electrons, due to its much higher electronegativity. The forces between water molecules are hydrogen bonds, which are relatively strong in comparison to other types of intermolecular bonds. 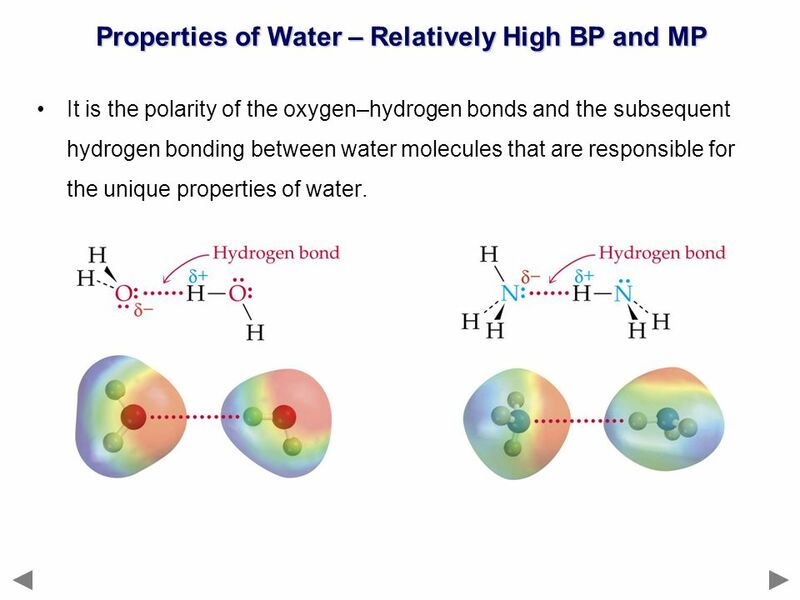 It is the polarity of the oxygen–hydrogen bonds and the subsequent hydrogen bonding between water molecules that are responsible for the unique properties of water. 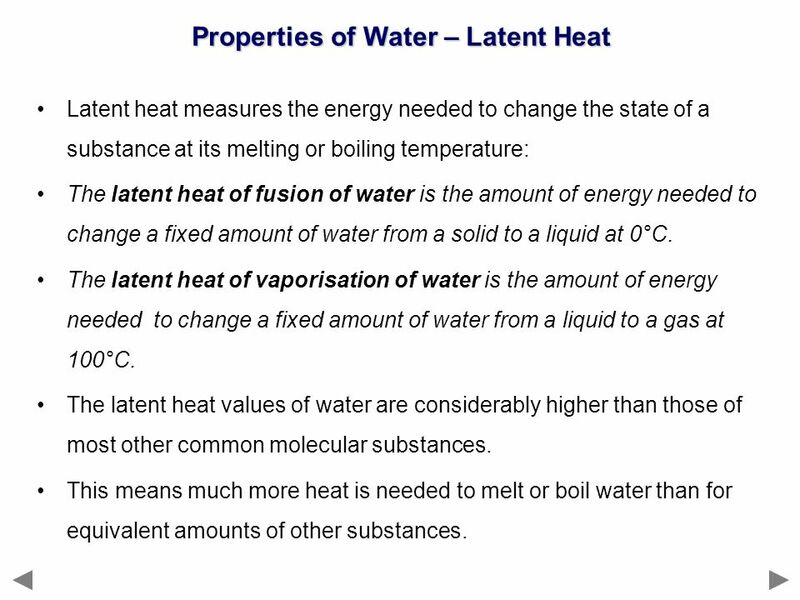 Latent heat measures the energy needed to change the state of a substance at its melting or boiling temperature: The latent heat of fusion of water is the amount of energy needed to change a fixed amount of water from a solid to a liquid at 0°C. The latent heat of vaporisation of water is the amount of energy needed to change a fixed amount of water from a liquid to a gas at 100°C. 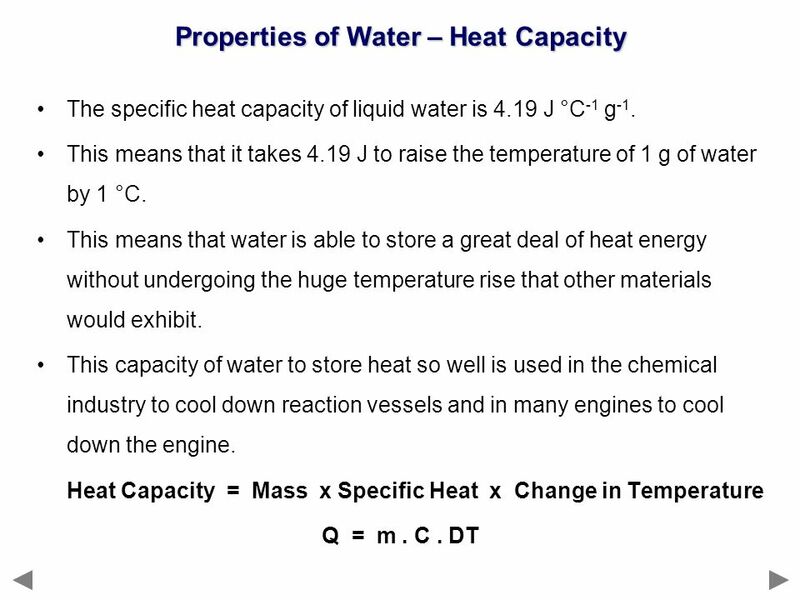 The latent heat values of water are considerably higher than those of most other common molecular substances. 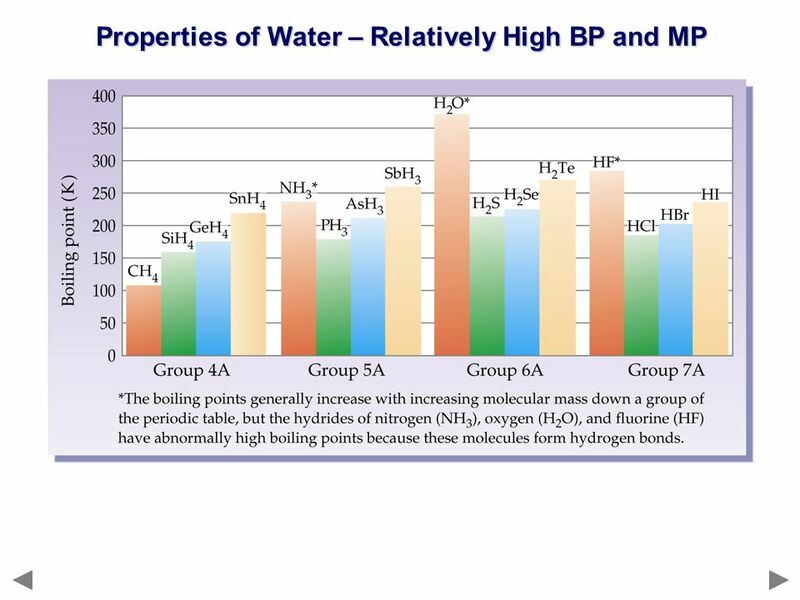 This means much more heat is needed to melt or boil water than for equivalent amounts of other substances. Oceans account for 71 per cent of the Earth’s surface. Their average depth is 6 km. These vast expanses of water play a very large part in controlling the climate of the Earth. One reason for the influence of the oceans on our climate is a property known as heat capacity. The specific heat capacity of a substance is the amount of energy, in joules, required to raise the temperature of 1 g of that substance by 1 °C. 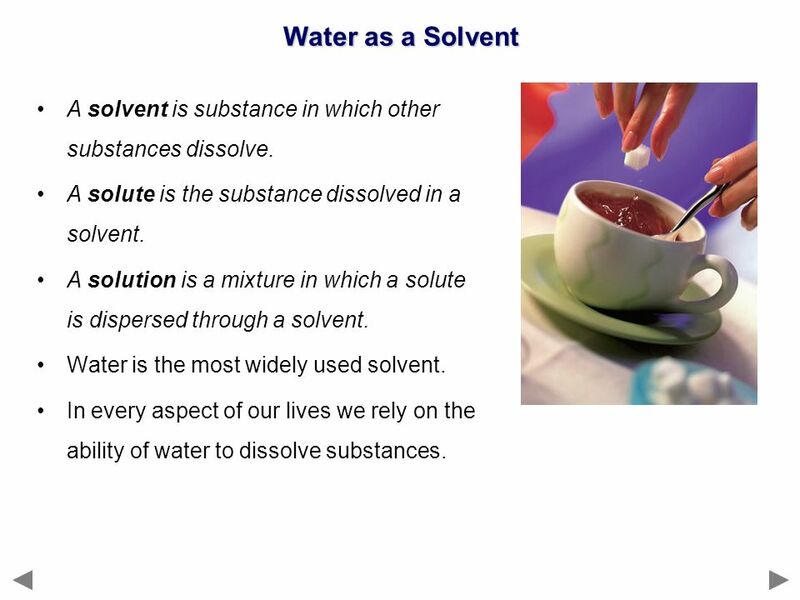 14 Water as a Solvent A solvent is substance in which other substances dissolve. A solute is the substance dissolved in a solvent. A solution is a mixture in which a solute is dispersed through a solvent. Water is the most widely used solvent. In every aspect of our lives we rely on the ability of water to dissolve substances. The process by which a solid substance completely dissolves in water could be considered to occur in stages. 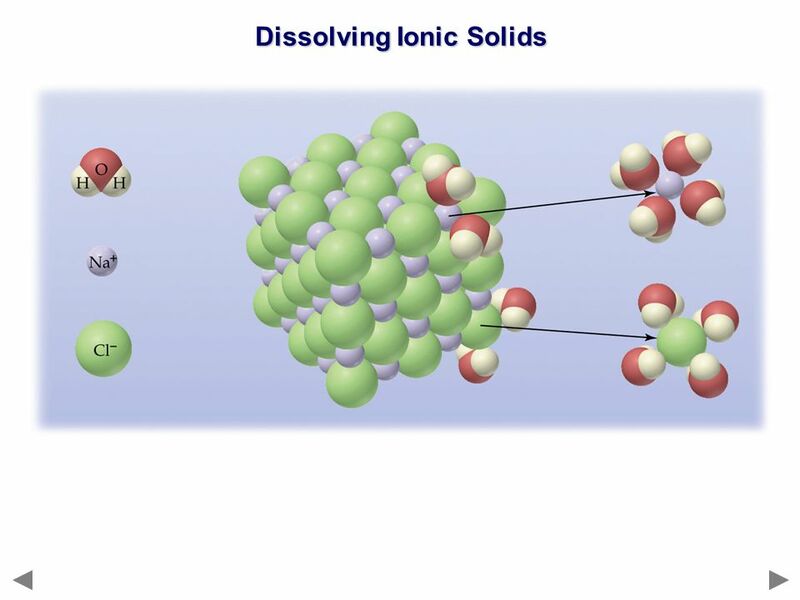 The mobile water molecules next to the surface of the solid attract surface particles away from the solid (via ion-dipole interactions). Once these particles are pulled away, they are surrounded by water molecules and are able to move through the water. Over time, the whole solid crystal dissolves, layer by layer, from the outside in. This process is known as dissociation. 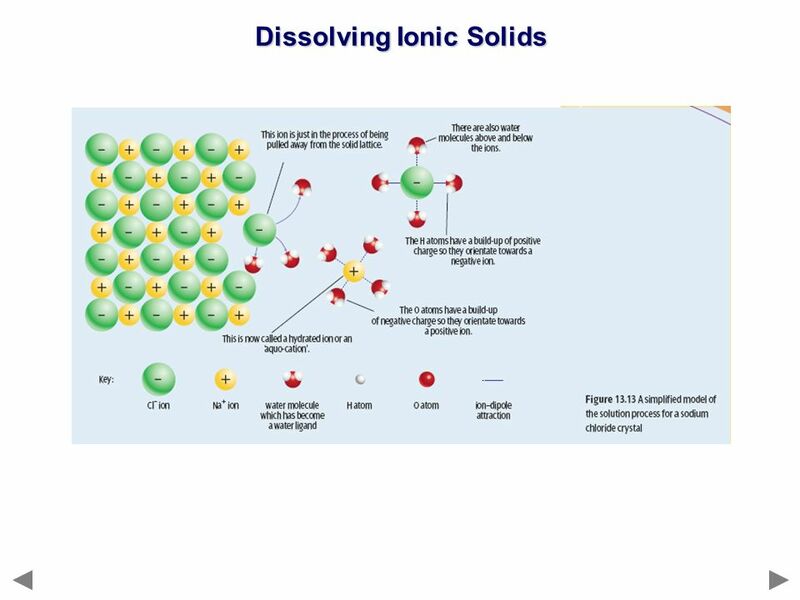 The process by which a molecular solid dissolves is very similar to that by which an ionic solid such as sodium chloride dissolves. Water generally only dissolves polar substances. 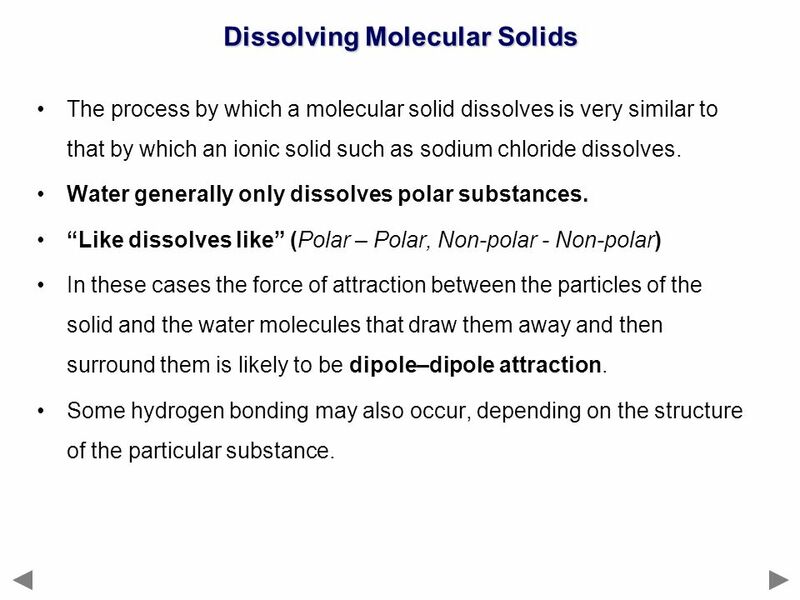 “Like dissolves like” (Polar – Polar, Non-polar - Non-polar) In these cases the force of attraction between the particles of the solid and the water molecules that draw them away and then surround them is likely to be dipole–dipole attraction. Some hydrogen bonding may also occur, depending on the structure of the particular substance. 19 Solubility The solubility of a substance refers to the maximum amount of that substance that can be dissolved in a given quantity of solvent at a certain temperature. A solution in which no more solute can be dissolved at that temperature is described as a saturated solution. The measure of solubility of a substance at a given temperature is how many grams dissolve in each 100 g of solvent to form a saturated solution. 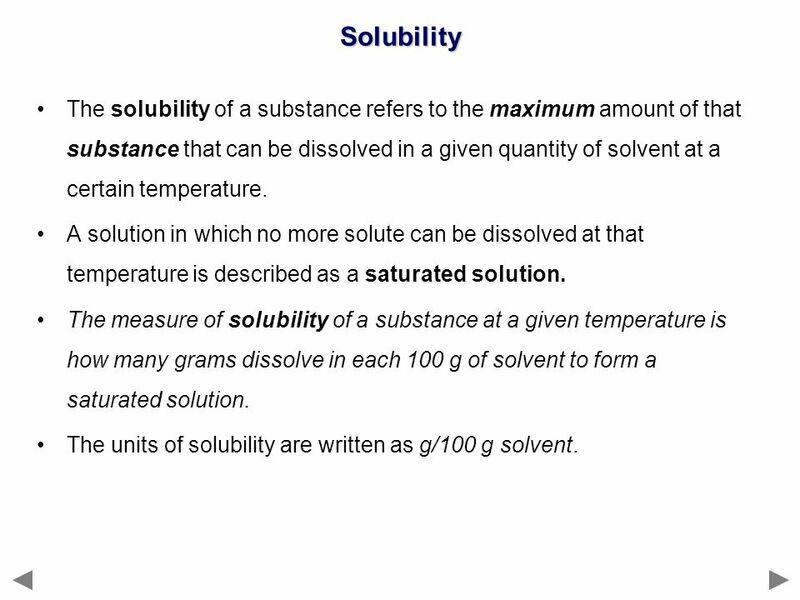 The units of solubility are written as g/100 g solvent. 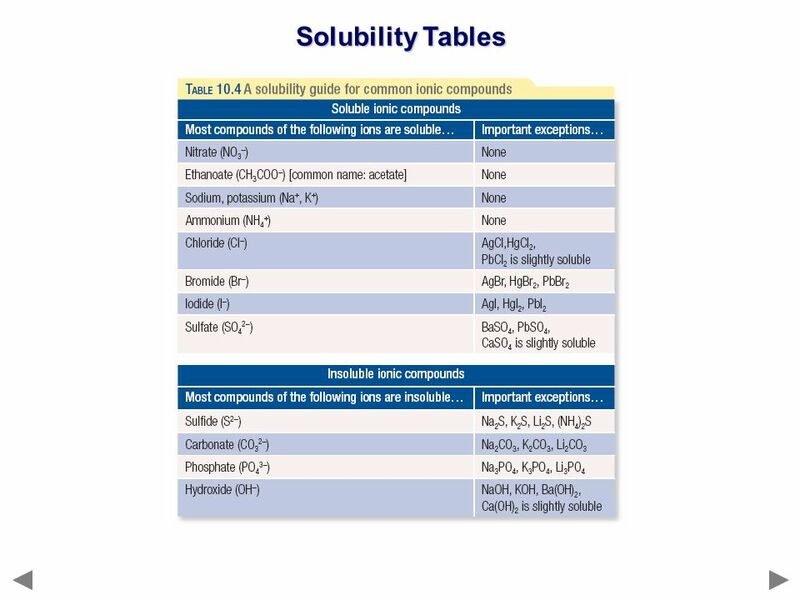 20 Solubility Solubility values allow us to compare the extent to which different solutes dissolve. Substances such as calcium carbonate, that have very, very small solubilities, are said to be insoluble. 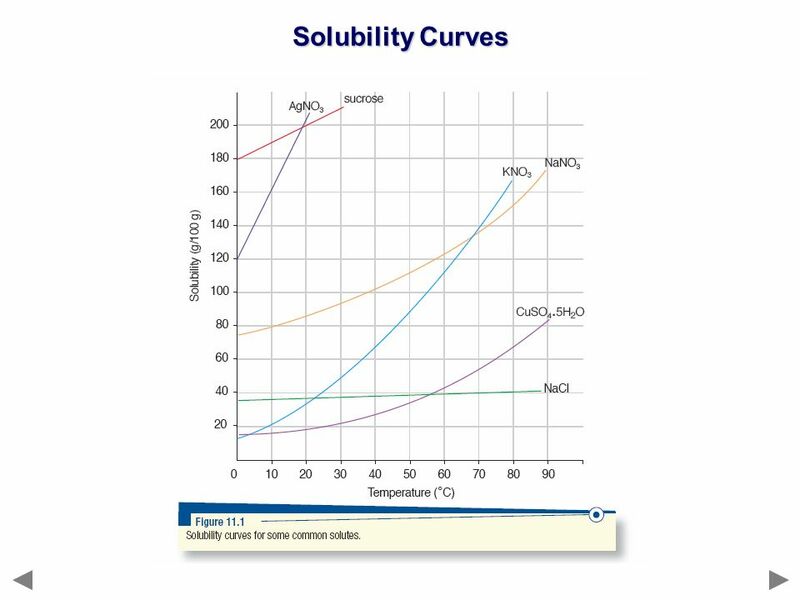 22 Solubility Curves The relationship between solubility and temperature can be represented by a solubility curve. 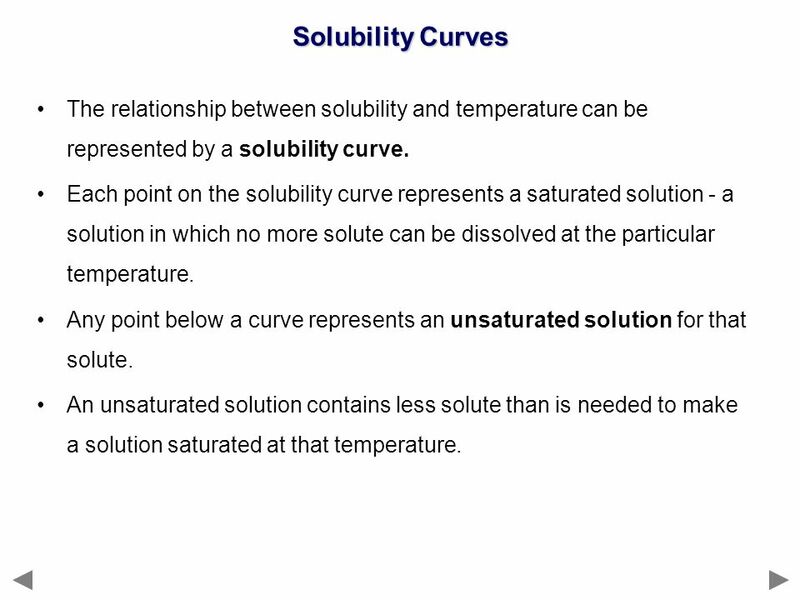 Each point on the solubility curve represents a saturated solution - a solution in which no more solute can be dissolved at the particular temperature. Any point below a curve represents an unsaturated solution for that solute. An unsaturated solution contains less solute than is needed to make a solution saturated at that temperature. 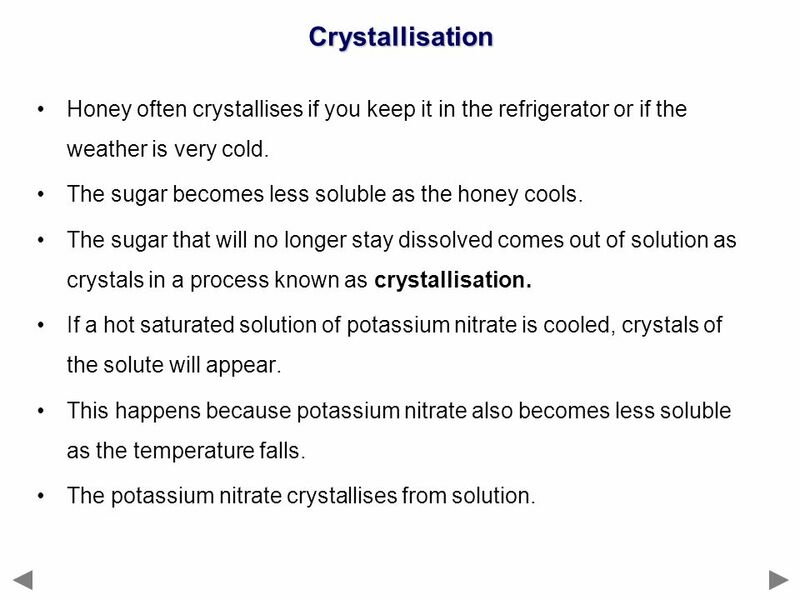 24 Crystallisation Honey often crystallises if you keep it in the refrigerator or if the weather is very cold. The sugar becomes less soluble as the honey cools. The sugar that will no longer stay dissolved comes out of solution as crystals in a process known as crystallisation. If a hot saturated solution of potassium nitrate is cooled, crystals of the solute will appear. This happens because potassium nitrate also becomes less soluble as the temperature falls. The potassium nitrate crystallises from solution. 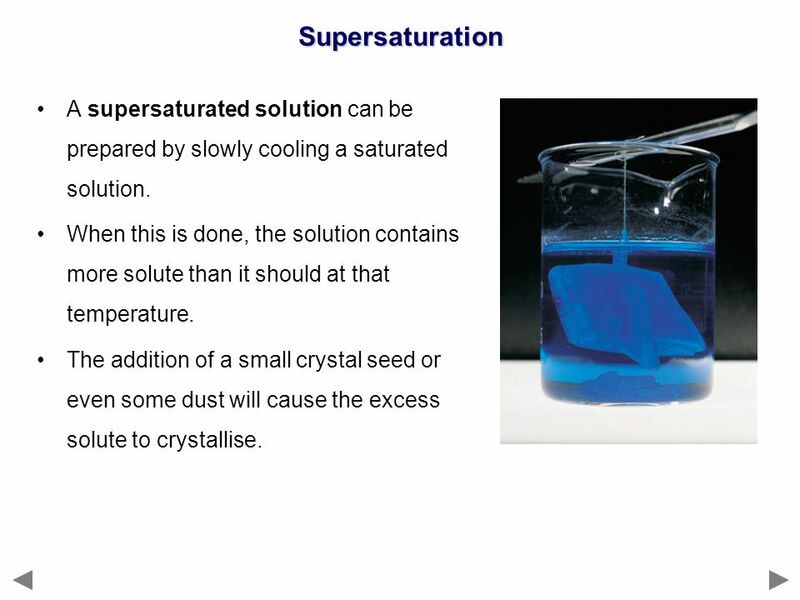 25 Supersaturation A supersaturated solution can be prepared by slowly cooling a saturated solution. When this is done, the solution contains more solute than it should at that temperature. The addition of a small crystal seed or even some dust will cause the excess solute to crystallise. 26 Water Purification Human activities have introduced many unwanted substances into our rivers and water supplies. These include paints, cleaners, insecticides, fertilisers, industrial wastes and other contaminants, including disease organisms. 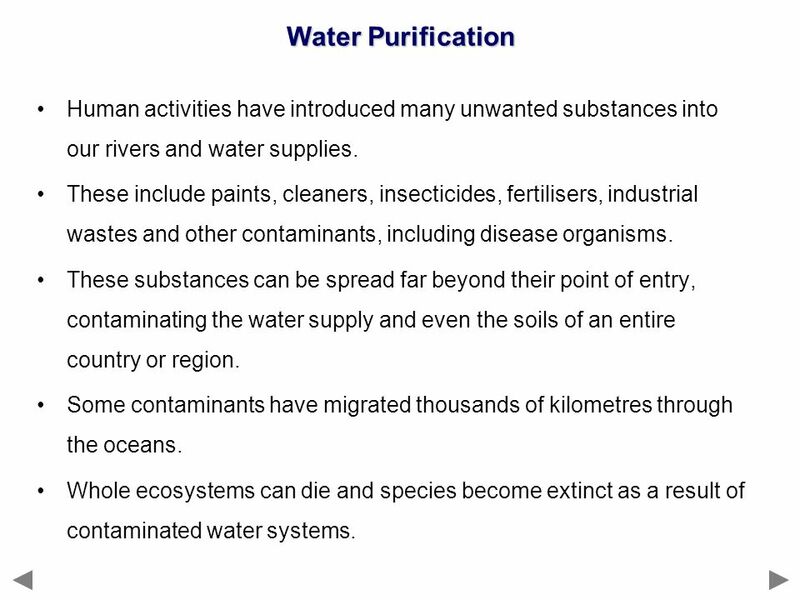 These substances can be spread far beyond their point of entry, contaminating the water supply and even the soils of an entire country or region. Some contaminants have migrated thousands of kilometres through the oceans. Whole ecosystems can die and species become extinct as a result of contaminated water systems. 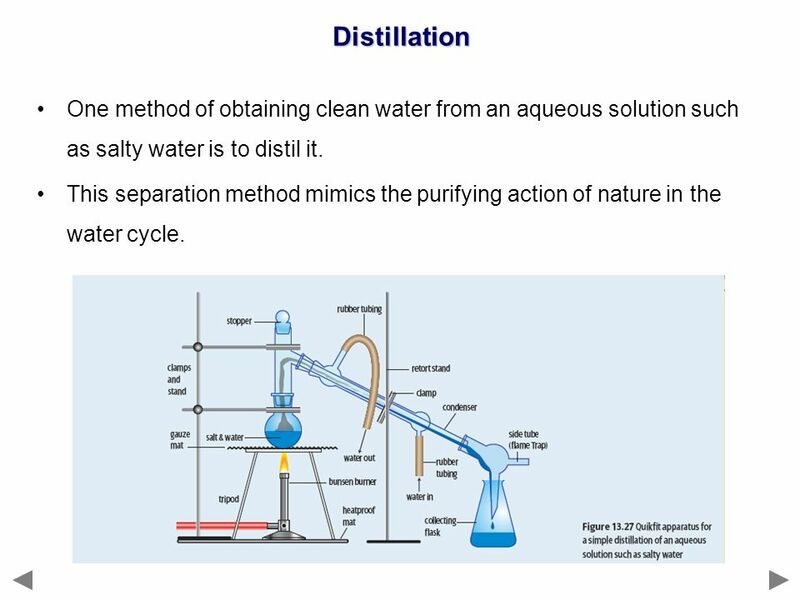 27 Distillation One method of obtaining clean water from an aqueous solution such as salty water is to distil it. This separation method mimics the purifying action of nature in the water cycle. 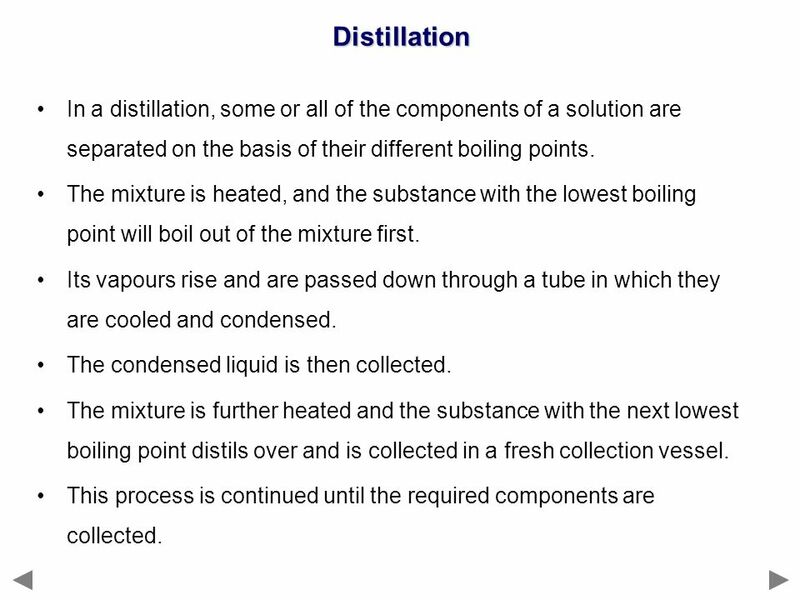 28 Distillation In a distillation, some or all of the components of a solution are separated on the basis of their different boiling points. The mixture is heated, and the substance with the lowest boiling point will boil out of the mixture first. Its vapours rise and are passed down through a tube in which they are cooled and condensed. The condensed liquid is then collected. The mixture is further heated and the substance with the next lowest boiling point distils over and is collected in a fresh collection vessel. This process is continued until the required components are collected. 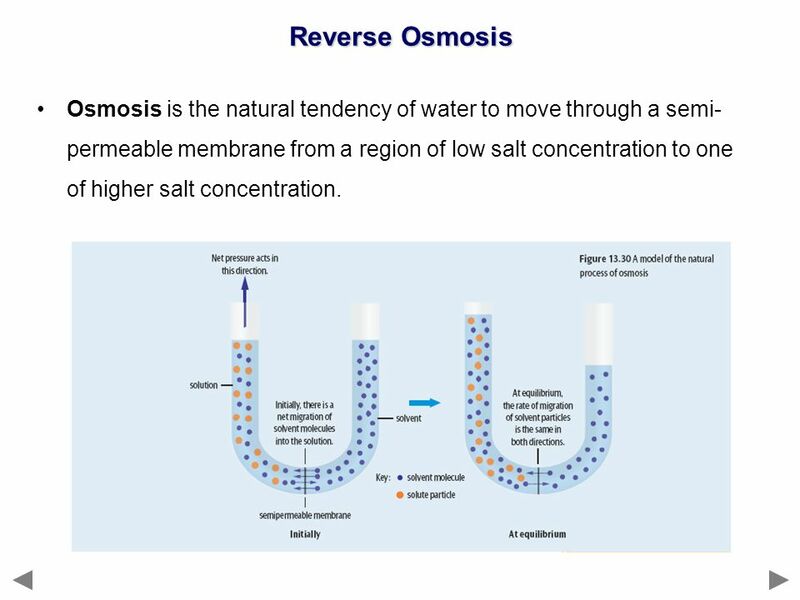 29 Reverse Osmosis Osmosis is the natural tendency of water to move through a semi-permeable membrane from a region of low salt concentration to one of higher salt concentration. 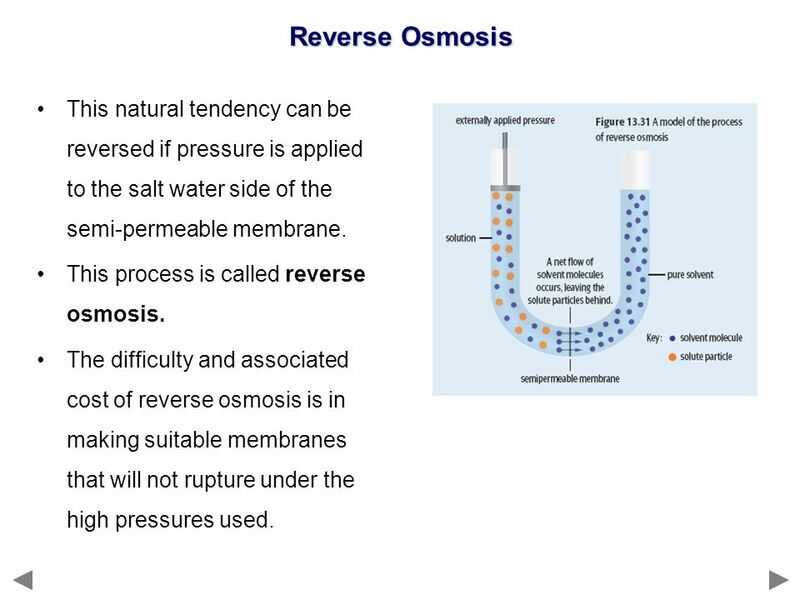 30 Reverse Osmosis This natural tendency can be reversed if pressure is applied to the salt water side of the semi-permeable membrane. This process is called reverse osmosis. The difficulty and associated cost of reverse osmosis is in making suitable membranes that will not rupture under the high pressures used. 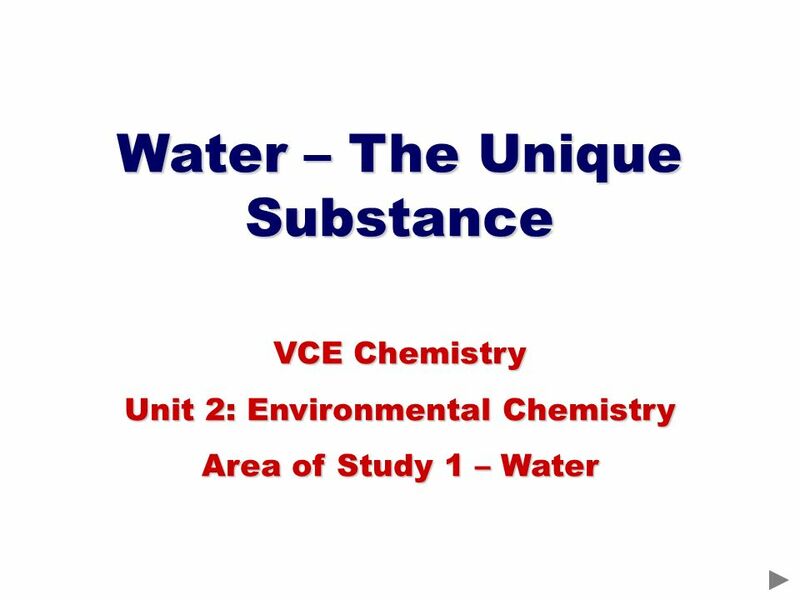 Download ppt "Water – The Unique Substance"
Unit 1 Lesson 1, Water and Its Properties. Watered Down What are some of water’s roles on Earth? Water shapes Earth’s surface and weather, and it is vital. 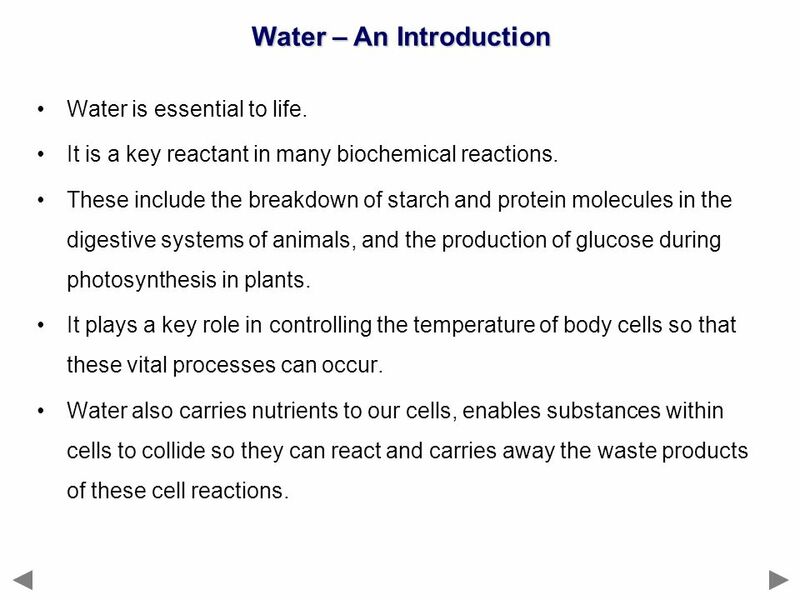 Overview: The Molecule That Supports All of Life Water is the biological medium on Earth All living organisms require water more than any other substance. Collision Theory Reactions occur when molecules collide together The collision theory says that: 1.atoms, ions, and molecules must collide in order to. 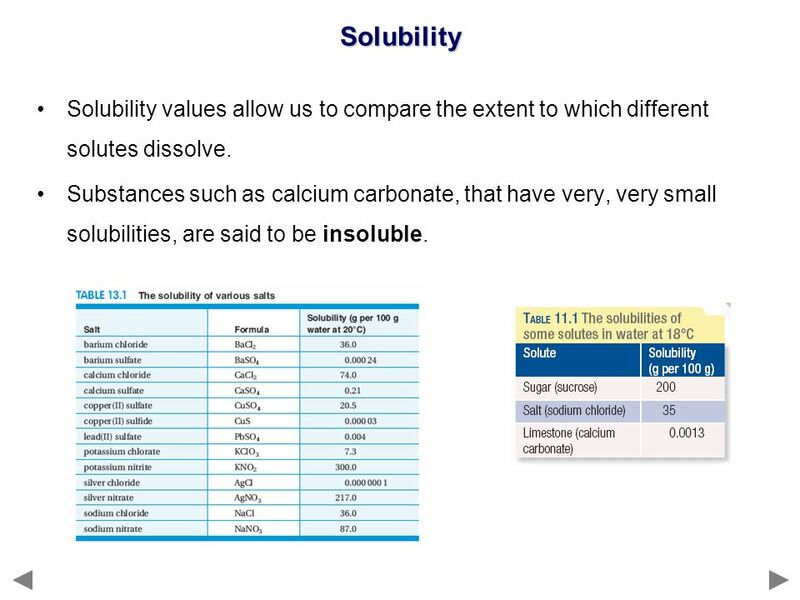 Unit 10 Review Describe the following terms Solution Solvent Solute Soluble Insoluble Miscible Immiscible Homogeneous mixtures of 2 or more substances. Lecture 4 Chemicals of Life. Biochemistry Biochemistry is the study of chemicals and chemical reactions/processes that occur in living organisms. PhysicsChemistryBiology. Water. 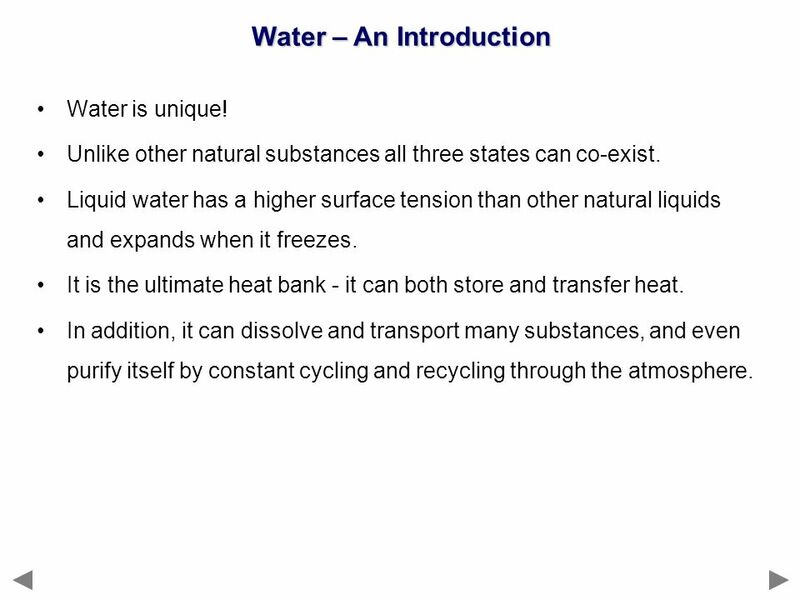 Water Water is a very unusual compound; it is very common and is found in all three conditional states, solid (as ice), liquid (as water) and gas. 1 Solutions. 2 E.Q. : WHAT IS A SOLUTION? 3 Does a chemical reaction take place when one substance dissolves in another? 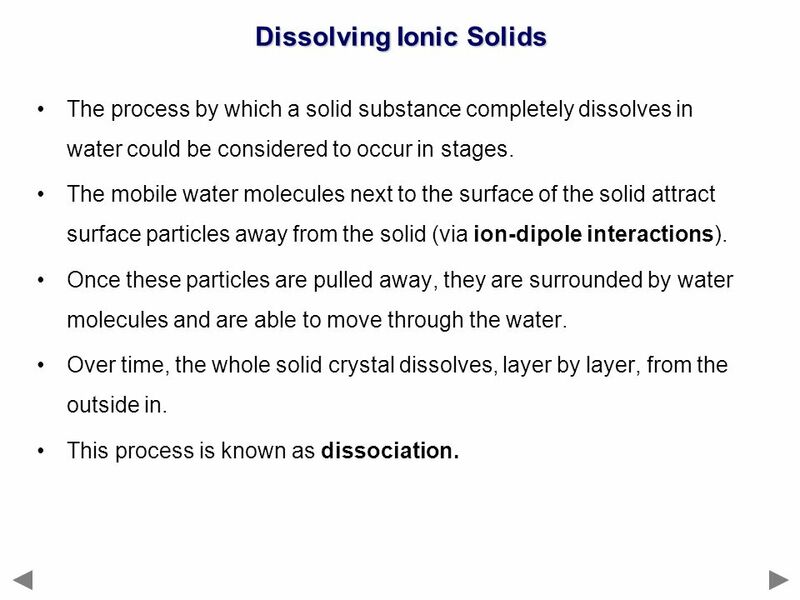 No, dissolving is a physical. II III I Hydrogen Bonding and The Nature of Solutions Ch. 13 & 14 - Solutions 1. 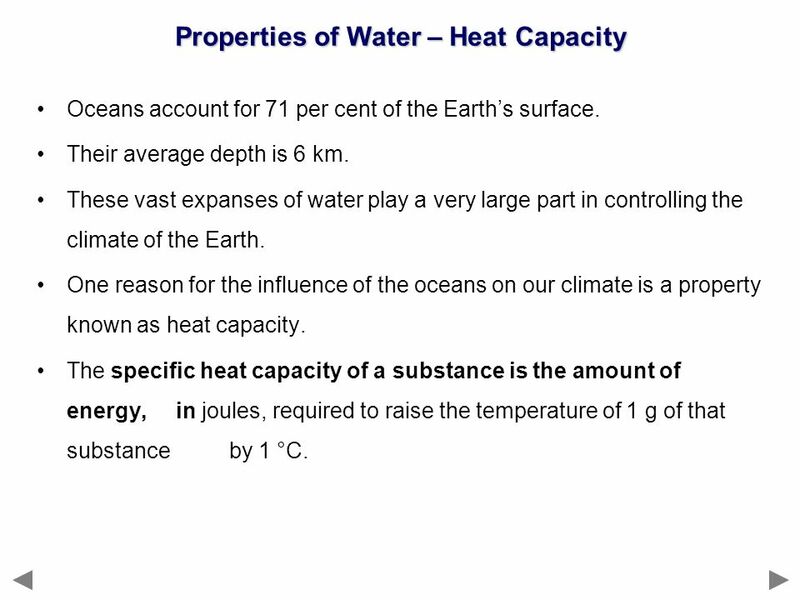 PROPERTIES OF WATER KL OCEANOGRAPHY UNIT II: OCEAN PLANET. 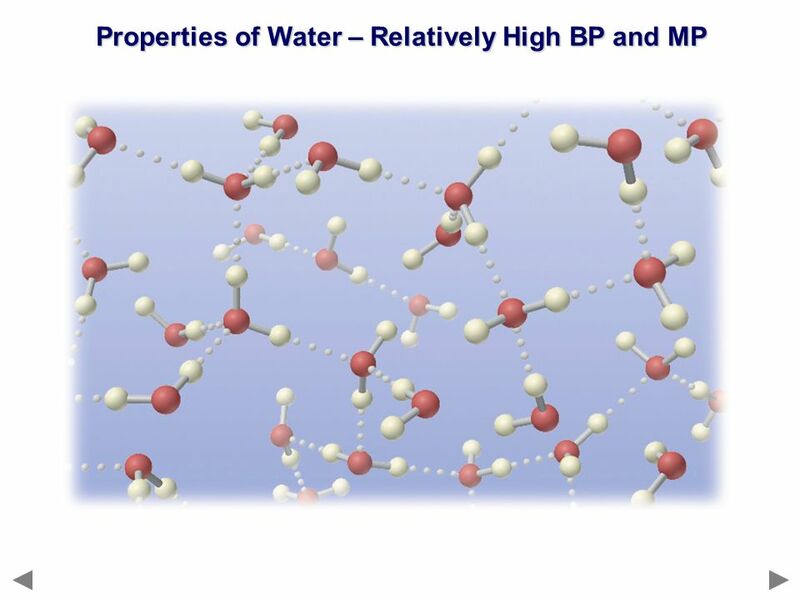 Water’s Unique Properties There are strong forces of attraction between molecules of water. 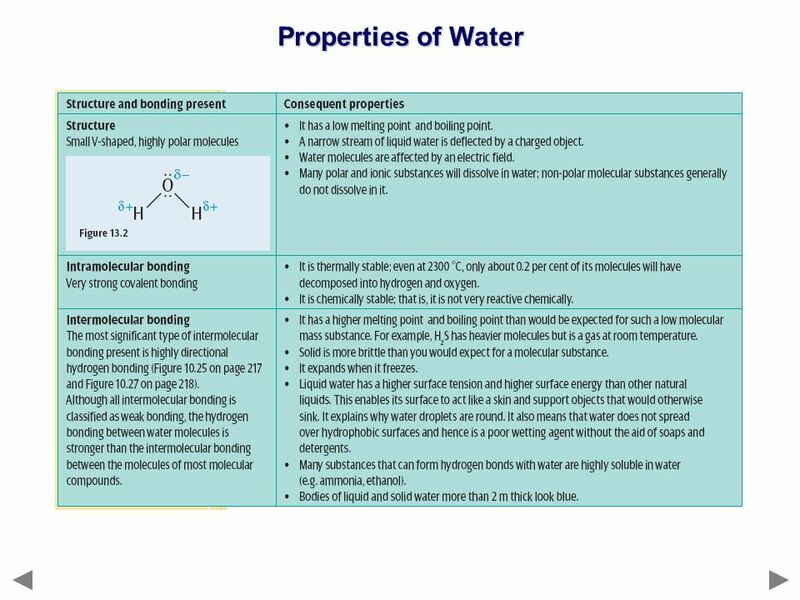 Hydrogen bonds Water is a polar molecule Water is amphoteric. Chapter 9: Water Block 1 Pink Table. Chapter 15 Solutions. Solution types & parts  Solutions can be: Solids – brass, dental fillings, chocolate bar Liquids – sodas, vinegar, salt water Gaseous. Formation of Compounds Answers to the notes outline will be highlighted in blue.